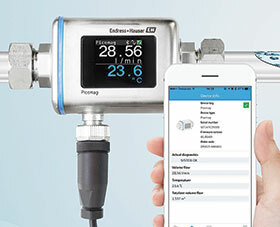 In industrial process measurement and automation, demand is steadily rising for simple, reliable and maintenance-free measuring instruments in a pocket-sized format. The new Picomag from Endress+Hauser fulfils such requirements with no compromises. Not only does it measure the flow of electrically conductive fluids, but also their process temperature. In addition, Picomag offers customers easy commissioning via Bluetooth and the SmartBlue app, as well as seamless system integration thanks to IO-Link technology, which makes the instrument Industry 4.0 ready. Plants are often equipped with compressed air, natural gas and water networks that service multiple departments and consumers within the facility. In addition to master flowmeters installed in the main lines, sub-meters can also be installed in auxiliary branches for monitoring purposes. These are chiefly for monitoring patterns of use, establishing baselines, allocating internal costs and for collecting data that can be used over time for optimisation purposes. Sub-meters are essential for energy monitoring systems, as they provide the means to analyse consumption patterns, set goals for improvement (reduction of consumption) and subsequently for evaluating the effectiveness of optimisation measures. Also leaks and unnecessary consumption can be eliminated by means of analysis of the data.